Divid 2000 was another company that crawled out of the woodwork in the early days of DVD to make a quick buck by releasing aged transfers of mediocre movies to a public starved of titles. Their first pair of releases were Silent Madness and Mario Bava’s 1987 subterranean zombie adventure Graveyard Disturbance (Una Notte al cimitero). 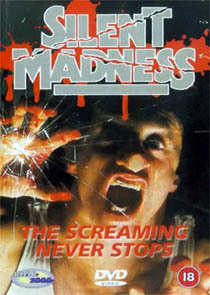 Silent Madness, a 1984 movie about a prematurely released mental patient, is presented in the same version released on VHS by Avatar in 1987, running 87’02” after 1’34” of BBFC cuts. The film is severely cropped from its ArriVision (2.35:1) theatrical version, and doesn’t even appear to be properly pan-and-scanned (it looks like the resulting image is simply locked onto the middle of the widescreen image). The picture is very grainy and weaves around the screen in a manner likely to make even hardened NYPD Blue viewers nauseas. The highly derivative film was planned as a late entry in the early-80s 3-D revival, explaining the frequent lunges towards camera and shots where depth of field seems to be the director’s principal concern. 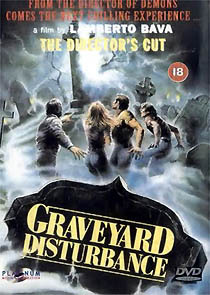 There’s a significant difference between the running time of the Graveyard Disturbance DVD (91’55”) and the BBFC’s stated duration when it was classified in 1988 (92’13”). Perhaps this is why the DVD being marketed as a “Director’s Cut”?! Divid 2000’s sleeves include disc specifications that seem deliberately designed to mislead the consumer. The “Dolby Digital AC3” sound is, of course, mere mono (Graveyard Disturbance) or stereo (Silent Madness), and “Lamberto Bava – the legacy” turns out to be two screens of skimpy biographical notes. Both discs contain haggard-looking trailers.